Vanilla Sugar Cookies – these basic cookies are a must for Christmas or other festive event, such as birthday or anniversary. 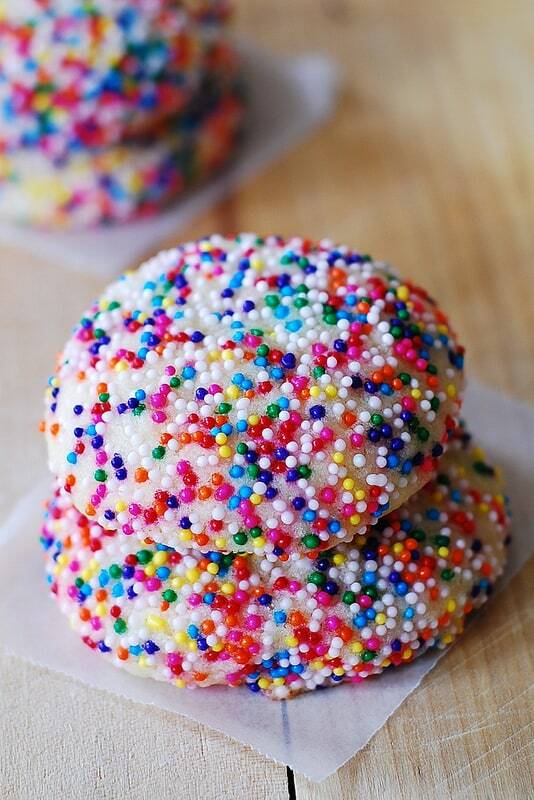 Make them festive by adding sprinkles! Also, read my note below for how to make sure that these vanilla sugar cookies have a perfect texture and are not dry. So, are you looking for a simple, delicious, and festive Holiday cookie recipe that does not involve a lot of time and effort but still looks like a true Christmas cookie? 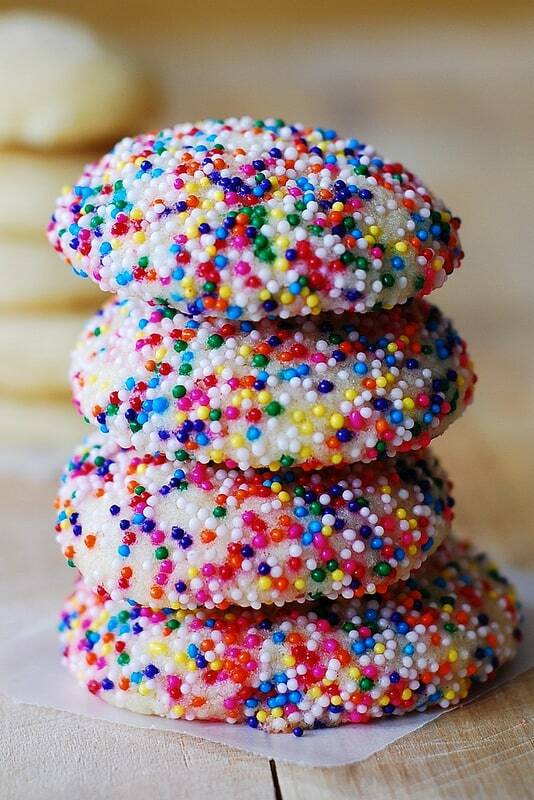 Then, try these perfectly shaped vanilla sugar cookies, decorated with colorful sprinkles! My other favorite simple Christmas cookie recipes are these almond shortbread cookies and pecan shortbread cookies. Do you notice this really cute, rounded (not flat) shape of these cookies? 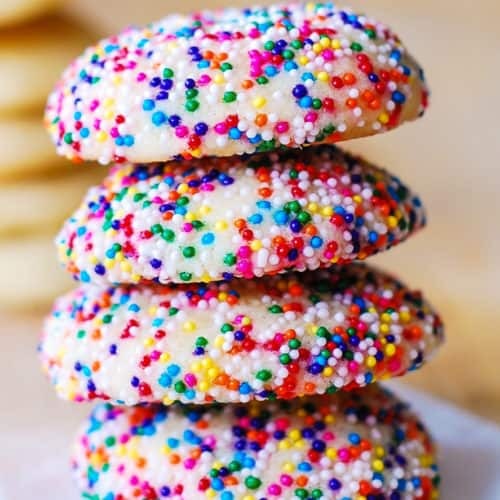 It makes them very attractive, and the secret to achieving such rounded cookie top is to roll the cookie dough into 1-inch balls (then roll in sprinkles), freeze them for 30 min, then refrigerate for 30 min and only then do you bake the cookies. Rolling the cookies generously in sprinkles creates a festive look without much effort. This is a perfect vanilla sugar cookie recipe if you don’t have time to frost them or otherwise decorate them. How to avoid dry cookie dough? Is your cookie dough too dry and the cookies crumble after baking? Here is how to make sure it doesn’t happen. It usually happens because you have used too much flour. So, let’s make sure we measure the flour the right way. The proper way to measure flour using measuring cups is to aerate it first. Aerate the flour by sifting it using a strainer. Aerate the flour by fluffing it up and whisking it well, then spooning it into the measuring cup, then carefully removing any excess flour with a knife. If you just stick that measuring cup in the bag of flour and scoop some out, you will get a lot more flour than what the recipe calls for. Do aerate the flour, or you will end up with dry cookie dough! I am usually very short on time so rolling these Christmas cookies in sprinkles works for me as a perfect way to dress them up! 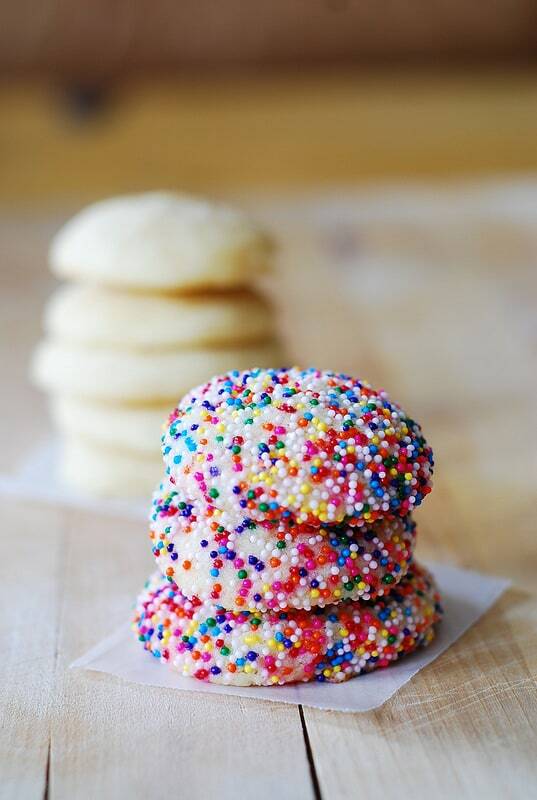 I love this recipe and will definitely be making these vanilla sugar cookies again! 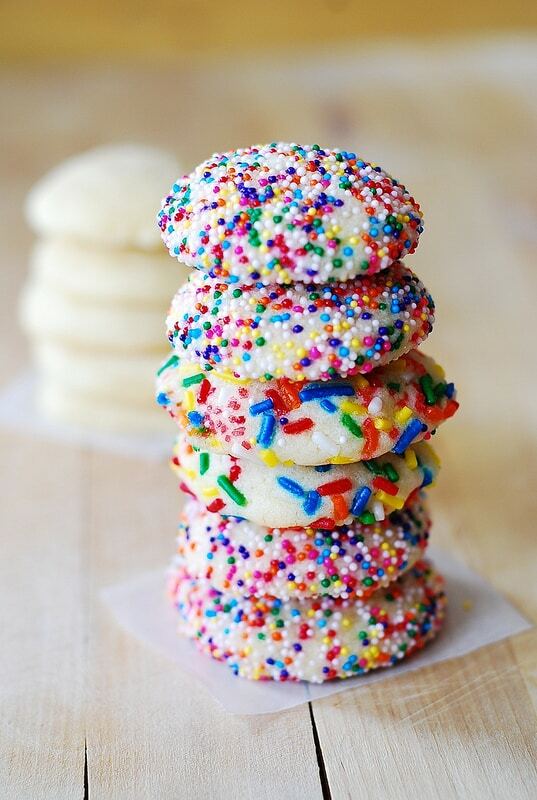 Perfectly shaped vanilla sugar cookies, decorated with colorful sprinkles. These are easy to make and they look super festive for Christmas and other holidays without much effort. In a medium bowl, combine together flour and salt and mix. In a separate bowl, using electric mixer, beat softened butter and granulated sugar until light in color and fluffy. Add an egg and vanilla – continue beating for a couple minutes. Turn off the electric mixer, add flour-salt mixture and then continue beating on low speed until well-combined but without over mixing. Roll dough into 1-inch balls. Roll these cookie balls in sprinkles. Arrange on parchment-lined baking sheets, spacing 2 inches apart. Freeze until firm, for about 30 minutes. Bake at 350 degrees F in the preheated oven for 14 minutes. Do not over-bake. Remove from the oven, and transfer to wire rack to cool completely. 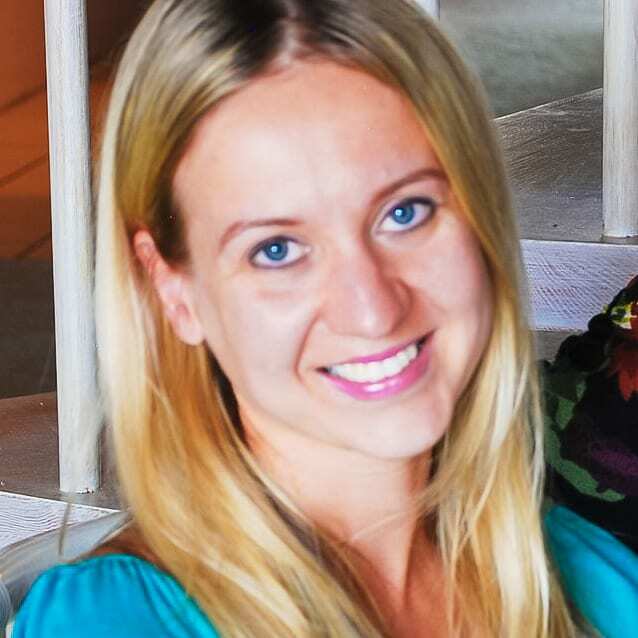 Chelsea, thank you for such a kind comment! I am so glad you found this recipe useful! Great tip about using the best vanilla for this recipe. Our cookies did not turn out well 🙁 They were very dry and not flavorful. These were so easy and delicious! My 3 year old had a great time rolling them in the sprinkles! Thanks for a wonderful recipe! Very pretty cookies! Looking forward to make them for my niece and husband who loves sprinkles. Will they work with Gluten free flour and flax egg?